Stone Arts of Alaska has available marine invertebrate fossils of Silurian, Devonian, and Permian age, all from southeast Alaska. Hexagonaria (called Xystriphyllum by some paleontologists) was widespread during the middle Devonian geologic period, approximately 380 million years ago. Today, as fossils, it is also found at a number of sites worldwide. It has been extinct for approximately 355 million years. This coral was a shallow water animal that lived in colonies. Each cell of the fossil material is the skeletal remains of a separate animal. They were stationary predatory animals, filter feeders with tentacles, like today’s sea anemones. It is called Hexagonaria because each cell is six-sided. It looks like honeycomb. Hexagonaria specimen--collection Stone Arts of Alaska, not for sale. Stone Arts of Alaska can supply quantity amounts of this attractive specimen material. Raw stone can be acquired (look under "Honeycomb coral" in our Lapidary Page) but polished pieces make better specimen material. Inexpensive, this material makes excellent stock for museum gift shops. 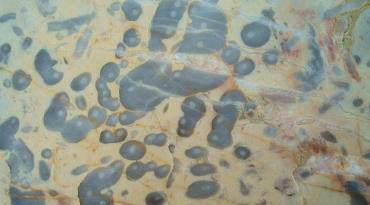 Polished slabs or boulders of Aphrodite marble are excellent for museum display. Smaller display pieces may also be purchased. See Finished Products - Indoor - Decorator Stones. 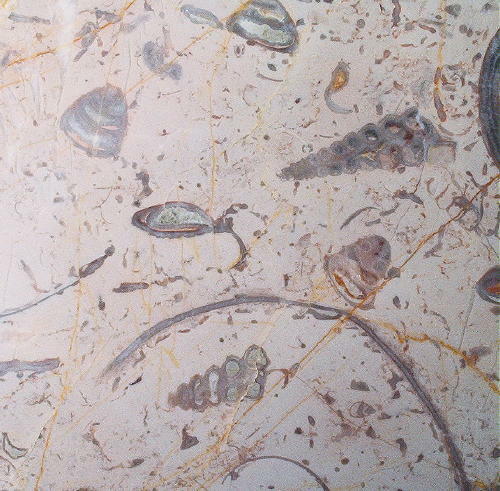 Some Paleontology: This marble, technically speaking, a fossiliferous limestone, contains mostly pelecypods but also brachiopods, gastropods, stromatolites, amphipora, cephalopods, and more. The visually dominant pelecypods are of the species Pycnodesma. They can be gigantic, as big as eleven inches in length. Interestingly, this species has never been found outside southeast Alaska. 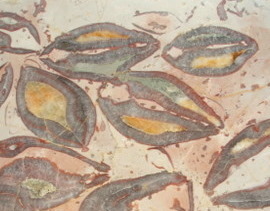 The fossils in the Golden variety of Aphrodite are amphipora (circles) and stromatolites (swirls). Nearly extinct today, stomatolites are the world's oldest known fossil. Some found in Australia date back more than three billion years. Stromatolites also occur in Royal Aphrodite. All the living forms now seen as fossils in this stone lived in a shallow sea during Silurian times, roughly 420 million years ago. Some catastrophic event, perhaps an underwater landslide or the deposition of silt from a nearby flooding river, brought about their sudden burial and death. They fossilized as the limey mud that encapsulated them hardened into stone. While the tectonic movement of the earth's plates makes the exact location of this ancient sea impossible to determine, some paleontologists believe it was close to the equator. Riding atop the earth's semi-liquid mantle, the chunk of continental crust carrying these fossilized tropical animals docked with the North American plate along the Alaskan shore sometime during the Cretaceous or Jurassic Periods, 65 to 190 million years ago. Feel welcome to view our Alaskan fossil collection in Bellingham, Washington.